Kahlua pie with coffee whipped cream! OMG, I am in heaven! Look at this recipe, can you just see my favorite Caffeine seething out? I might even have a coffee with this! 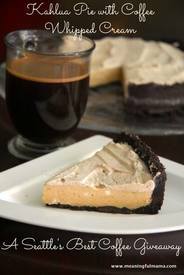 Kahlua Pie with Coffee Whipped Cream is the perfect desert for the coffee lover in your life. Happy National Kahlua Day!